Our general recommendations for Merida are the same as everywhere we’ve traveled. If you want good and inexpensive local food, go where the locals eat. That usually means taking a flyer on a crowded place just a bit away from the tourist trail that doesn’t specifically cater to English-speaking patrons. If, on the other had, you’re looking for good western style food and are a bit less concerned about price, go to where the expats eat. That may be in the tourist section of town, or it may be in a different expat hood altogether. In Merida, it’s the latter. We sought out both options because regardless of how great the local food is, as the late, great Wes Nations once said, sometimes you just want a friggin’ burger. Here’s where we found both. We would never have eaten here if we hadn’t struck up a conversation with a random local professor we met on the street. After chatting for a bit we asked him for restaurant recommendations, making sure to first mention that we already ate at the local Santa Ana market so he’d know we were comfortable navigating local dives. After wrinkling his nose at the mention of the market (an assessment we agree with) he told us about El Trapiche. We’re glad he did because otherwise we’d have walked right by. It’s only a block away from Plaza de la Independence, one of Merida’s main tourist attractions, and on the surface it didn’t look like our kind of place. But that’s because we’d have overlooked the chalkboard handwritten in Spanish that leans just beneath their laminated English language menu. That chalkboard is the Menu del Dia (menu of the day), and it’s the secret to why this otherwise tourist-friendly restaurant is packed with locals at lunchtime. For 55 pesos (about $3.00) the Menu del Dia came with chips, three salsas, a big bowl of soup, a choice of three or four main course meat dishes with rice and beans, corn tortillas, and a choice between two terrific local fruit infused waters to drink. As you’d guess from the name, the menu of the day changes daily so it’s a place you can go back to again and again and we did. The food is solid but not extravagant. 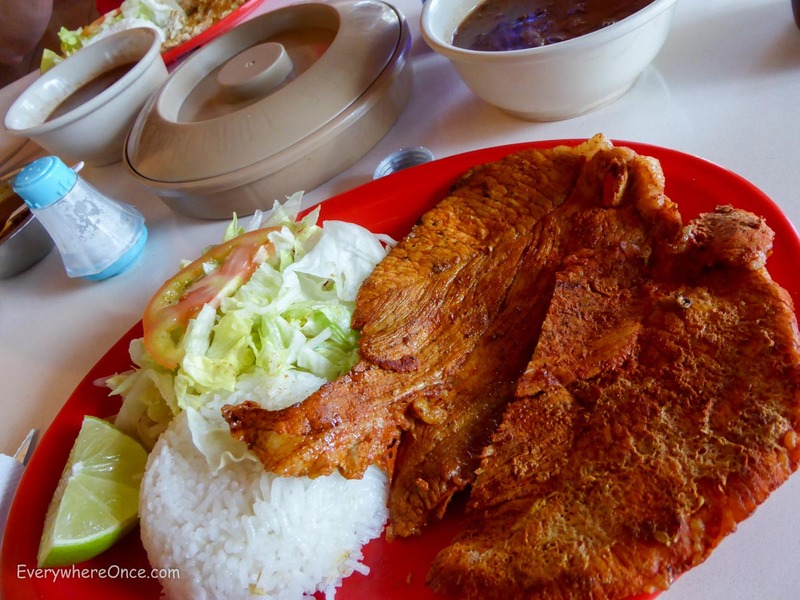 What you’ll find here is simple Mayan cuisine at eye popping prices. El Trapiche serves menu del dia sometime after 12:30 – the exact time seems to change with the menu. Where to find El Trapiche: Just north of Plaza de la Independence on Calle 62 between Calle 59 and Calle 61. 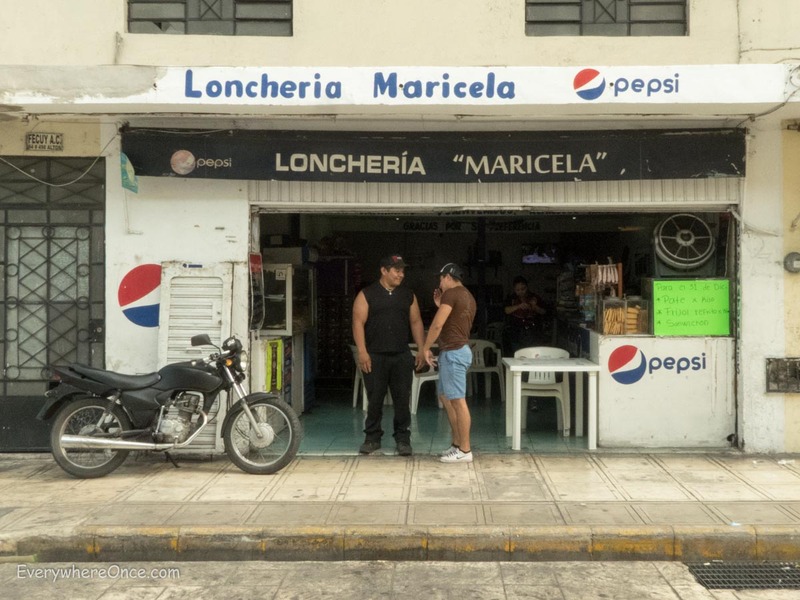 We discovered Loncheria Maricela after being told by El Trapiche that we couldn’t order off the menu del dia until an hour after we had eaten it the previous day. What started as a disappointment ended as a blessing. You won’t find English language menus here or necessarily even English-speaking staff. 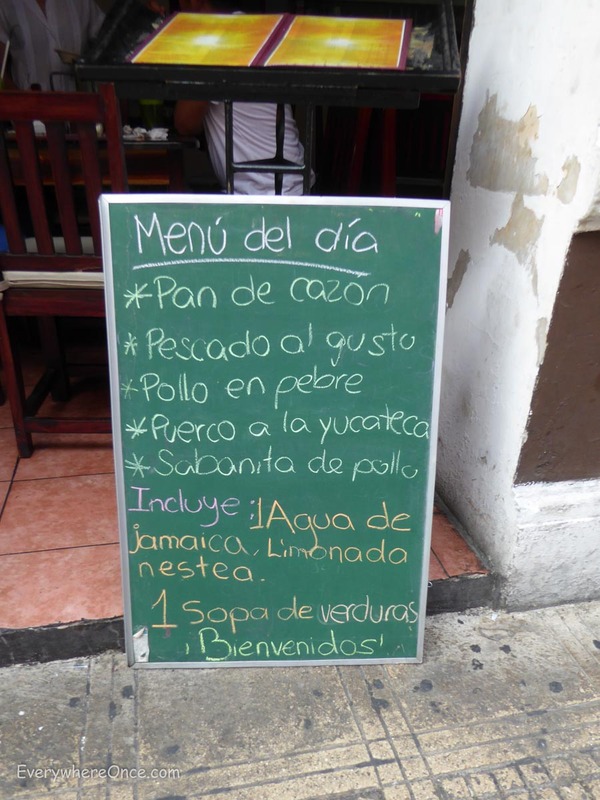 There’s an erasable board out front that we think advertises specials, but it also seemed like they serve other dishes that aren’t printed anywhere. This is a time to practice your Spanish and your taste for adventure. If you don’t speak any Spanish you really don’t need to know much. You can simply point at something someone else is eating that looks good and, as apologetically sounding as you can muster, say “Uno, por favor” (One please). A better (in my view) approach is to ask, “Lo que es bueno?” (What is good?) After the first reply that sounds like it might be food say, “Si. Uno, por favor.” (Yes. One please.) And then wait for your mystery meal to arrive. We ended up getting huge plates overflowing with chicken enchiladas smothered in mole. It was probably the best meal either of us had eaten in Mexico so far. The chicken was moist and clearly slow-roasted. I’m typically not a fan of mole, but this was rich and not too sweet with just a hint of chocolate. Delicious. Two plates of enchiladas and one Coke Light cost us 102 pesos or about $5.70. Even at what were probably Gringo prices we felt like we got a good deal. Where to find Loncheria Maricela: On Cale 64 between Cale 59 and Cale 61. La Reina de Montejo is another local establishment with rickety red and white plastic tables, matching chairs, and good cheap food. There is a small menu with a couple of options for tacos and other bite-sized snacks. They also serve a couple of main dishes with rice, beans, tortillas, and the all-important salsa picante. A meal here with drinks would typically run us about 110 pesos for two ($6.00). Where to find La Reina de Montejo: Paseo de Montejo between Calle 35 and Calle 37. The food off the menu here is awful, but they make up for that by serving draft beer and even mixed drinks in liter sized mason jars. And if you’re only a little peckish, waiters continuously deposit baskets of free chips, popcorn and other snacks at your table to have with your bucket ‘o beverage. None of which is why La Negrita Cantina made our list. No, we included it because the place is absolutely jammed with locals who crowd into its big bar to shake their booties to live Latin music. Even if you don’t dance, it’s a great place to mingle with people who clearly love to. Where to find La Negrita Cantina: On the corner of Calle 49 and Calle 62. Boo-Yah! Mexican beers that don’t blow! Huge tasty burgers, crispy and deliciously seasoned fries, and some pretty terrific Mexican craft brews are all good reasons to stop by this expat bar on the mansion-lined Paseo de Montejo. Where to find Hennessy’s Irish Pub: Paseo de Montejo between Calle 41 and Calle 43. 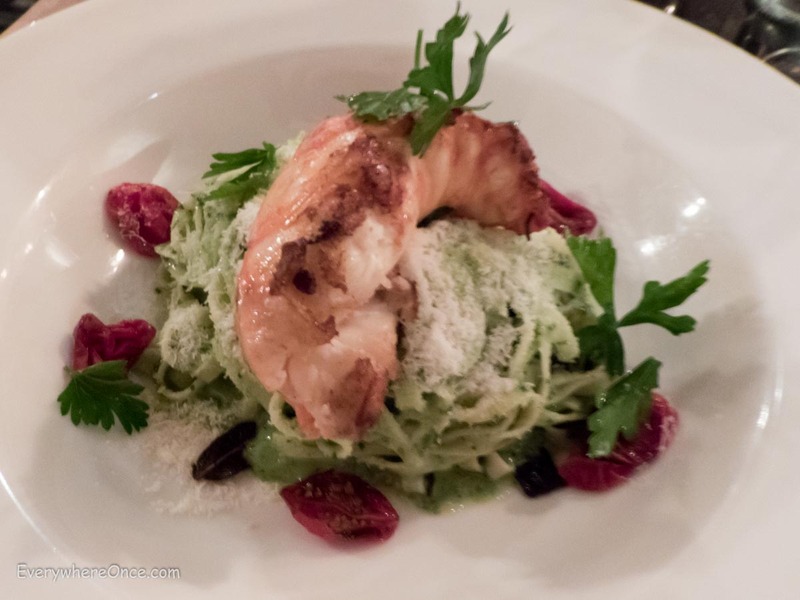 If you’re in the mood for something a bit more formal, Oliva serves up some pretty innovative Italian fare and pairs it with the best wines we’ve had in Mexico. Not everything we ate at Oliva’s blew us away. The fresh pasta was occasionally overcooked (I prefer al dente) and the pesto lacked the signature basil and Parmesan flavor I expect. But Oliva’s smoked provolone appetizer, with its incredible crème-brulee-like caramelized casing, is reason enough to go. As are their terrific tempranillos poured by the glass, great goat cheese ravioli, and good basic pasta marinara. Where to find Oliva Enoteca: The corner of Calle 54 and Calle 47. Those delicacies make my mouth watering. Thanks for sharing. So stunning information you shared…! Thank you! So, what happened to this blog ? And Brian and Shannon ? Where are you ? Thanks for asking about us. We’re doing well. Currently in Paris on our way to the Loire Valley. As you can see, we (or I should say “I”) unceremoniously abandoned the blog some time ago. I guess I should have written a final post, but I don’t think I ever thought this last update from Mexico would be the last one written. But I kind of took a break from writing and, as it turned out, that break never ended. We recently took a break from full-time travel. We’ve found staying in one spot to be meaningfully more expensive than traveling full-time. And our vacation travel now is also much more expensive on a dollar-per-day basis then what we used to spend full-time. And that’s without factoring in all the fixed costs of maintaining a permanent residence while vacationing. Curious – would you resume full time travel when you both retire? Also, most people who do not blog to support their nomadic travel lifestyle give up blogging because it is a lot of work and trying to develop interesting content is tiring – or so I have found following numerous blogs.